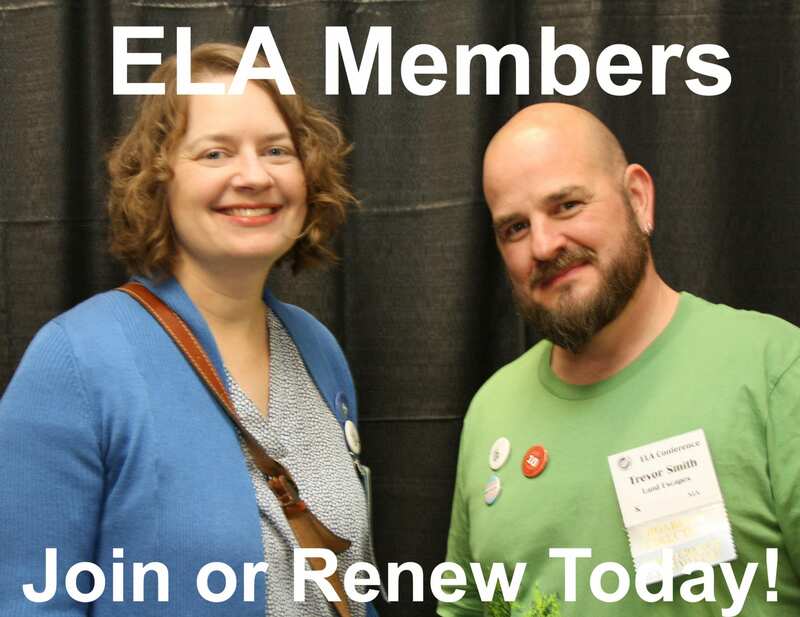 ELA recently wondered what our members are up to. What changes have they seen in their ecological landscapes and what new directions do they see their businesses or organizations going in the next few years? What ecological practices are resonating with their clients? We’ve asked a few members to give us a glimpse inside their organizations. Sue Avery: I hold a Certificate in Landscape Design from the Landscape Institute of the Arnold Arboretum of Harvard University. A degree in biological sciences and an extensive knowledge of plants informs me in my work and a passionate regard for the natural world drives my business. As an Accredited Organic Land Care Professional I practice by considering the health of the soil and the ecology of the garden foremost. I also have many years of experience in horticulture and a continuing involvement volunteering for conservation and civic beautification organizations. Company: Nature’s Edge. Mike Murphy: I was working in an office when I hired a tree company to care for the trees on the property. I asked if they knew of a small business in the organic field and they offered a small lawn care division they had opened. I went to work for them for a year and bought Soil Solutions in 2003. My son graduated from UMass in Landscape Contracting in June and we hope he’ll be able to take the company from almost exclusively lawn care to full service landscaping. New Moon Nursery: New Moon Nursery was founded in 2003 by James and Kimberly Brown. Our mission is to provide regionally appropriate starter plants of high quality at a fair price. We focus on selection, quality, information and availability. Together James and Kim had 25 years of experience in the horticultural industry when New Moon began. New Moon is wrapping up its 12th year in business. We continue to grow at a healthy pace, as demand for native plant material continues to grow. Sandy Vorce: I work for Mass Audubon where I engage volunteers and visitors in tending and learning about everything in nature from gardens to goats. Mass Audubon works to protect the nature of Massachusetts for people and wildlife. Together with more than 100,000 members, we care for 35,000 acres of conservation land, provide school, camp, and other educational programs for 225,000 children and adults annually, and advocate for sound environmental policies at local, state, and federal levels. ELA: How has the focus of your business or field changed over the last few years? SA: The focus of my business, which I only started a few years ago, has always been ecologically-sensitive landscape design. I design gardens using, primarily, native plants to improve wildlife habitat and increase biodiversity. I try to eliminate elements that are detrimental to the environment, i.e. large areas of lawn, and maintenance that requires herbicides or pesticides. MM: We’ve been doing organic lawn care for the past 14 years. After growing 10% to 20% each year we’ve stabilized at between 700 and 800 lawn customers. That is actually plenty as the work is very seasonal. We have increased our services to include maintenance of perennial beds and installation of hardscapes. NM: When we started New Moon Nursery in 2003 we were dedicated to maintaining a focus on eastern native plant species and their cultivars. As the years have progressed, and our nursery has grown, we find it increasingly difficult to maintain that focus, for two reasons. First, many of our customers, be they designers or wholesale container producers, ask us to grow other non-native species they have difficulty finding. The pressure is increasing. We will maintain our native focus, but might include some other very good garden plants that do not strictly fall into the “native” category. Second, the horticulturalist in us wants to grow some species that are not strictly native. Although we want to maintain our focus, it can be boring after a while, and there are so many really great garden plants that pair well with natives. We feel in order to convince the average gardener, or better yet one who isn’t a gardener at all, to plant natives, we need to offer a line of more traditional choices. SV: Mass Audubon Habitat Wildlife Sanctuary and Education center has gotten a lot busier over the past few years. 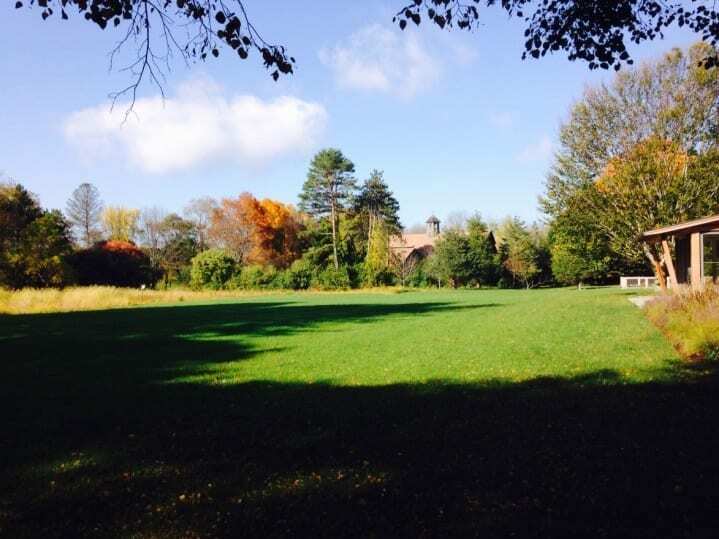 There has been a significant increase in: weddings and events which use the formal gardens as a backdrop; visitors to the trails; community gardeners; campers and program participants; as well as individual and group volunteers. As a result, I’m spending more time and resources on maintaining the landscape, educating visitors and volunteers, and studying the impact on the increased activity on the ecology of the sanctuary. 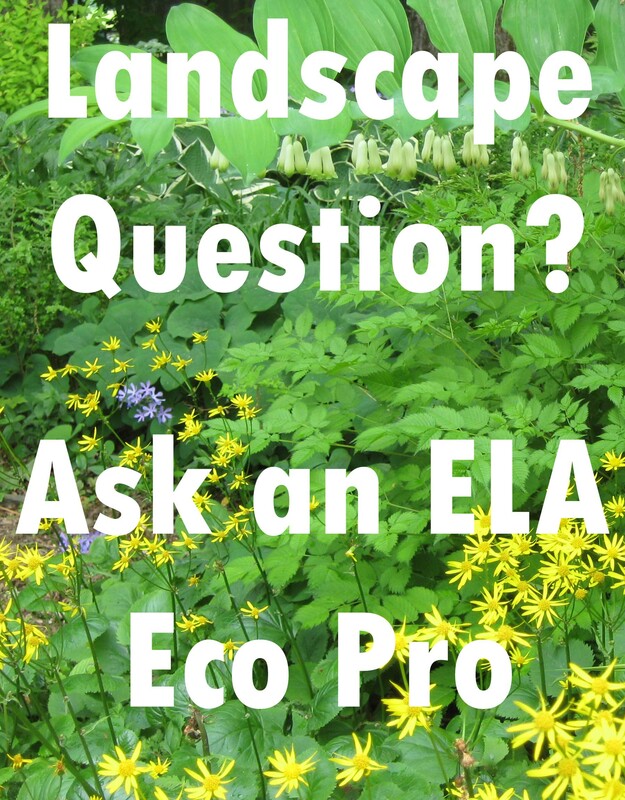 ELA: What ecological services have resonated most with your clients or students? SA: The meadows and native plant gardens that I have designed support nutrient cycles that benefit pollinators and birds. My clients are pleased with a more dynamic and interesting landscape and I hope they also realize the spiritual and recreational benefits. MM: Organic lawn care and particularly the seeding and core aerating we do in the fall. We mow about 40 lawns with walk behind mowers and that’s popular because we mow high and leave the clippings. This year we did a soil drench for bushes and perennials that was well received. 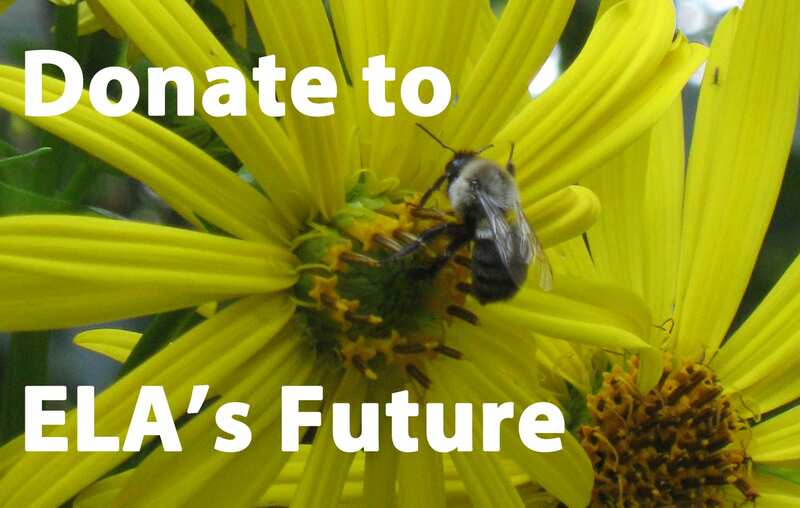 NM: Certainly the idea we can significantly help the pollinators is foremost on everyone’s mind. It’s a shame we have to focus on the beauty of the Monarch and the economy of the bees in order to get a pulse going. These are the poster children of a much greater problem. 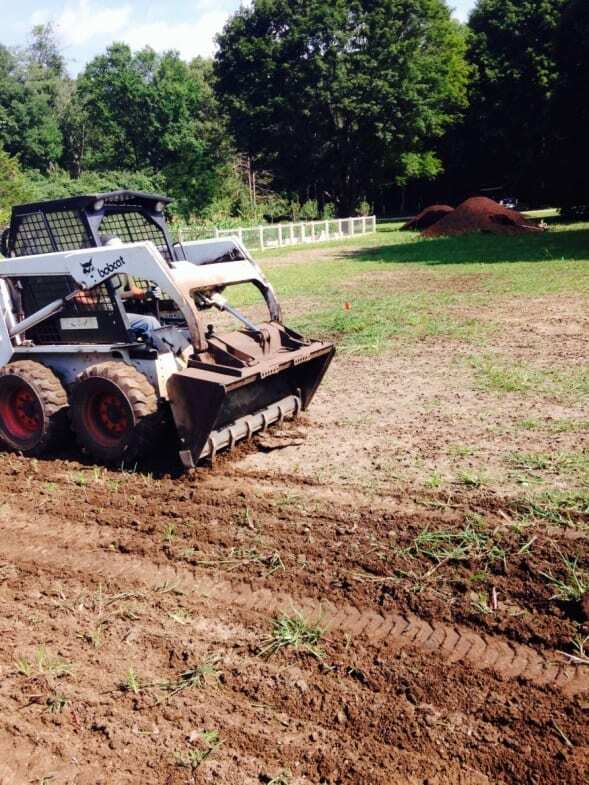 Soil stabilization and phytoremediation are also key services we find our customers are interested in. 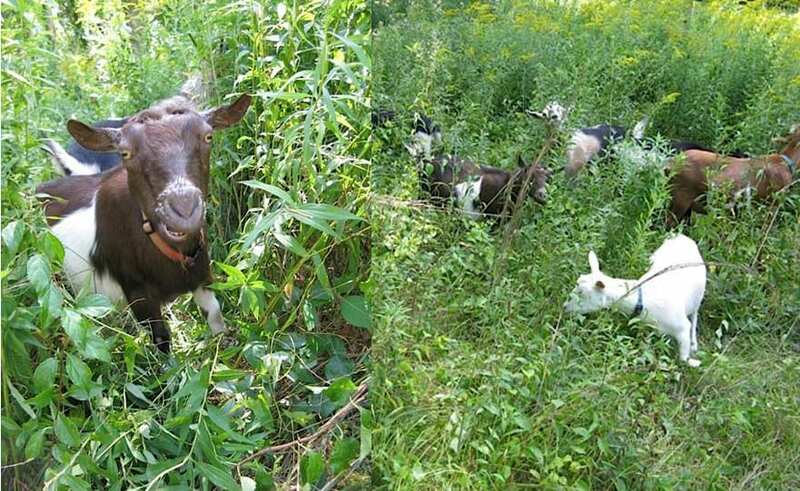 SV: People love that I’m using goats to restore and maintain the meadows. There has also been an interest in low carbon solutions to landscape activities such as using reel mowers to mow the formal garden lawns, grass whips to manage the sides of trails, collecting water off roofs for watering plants, and engaging volunteers to cut and pull invasive plants. ELA: Over the next few years, what direction would you like to see your business or research go in? SA: I would like to team up with a landscape maintenance business that manages gardens in an eco-friendly way and that knows how to work with native plants. MM: We’d like to be more of a full service company to our loyal customer base and expand opportunities to our employees. NM: We are continuously looking to offer better natives for all landscape situations. We would like to see the general population interested and appreciating regionally appropriate plantings, to better connect with the natural world. We will continue to provide more comprehensive information regarding regionally appropriate landscape choices. SV: I’d like to engage visitors and volunteers in more citizen science activities, such as wildlife monitoring and plant inventories so we can better gauge the positive and negative impacts of our work. ELA: Describe a particularly successful project, perhaps one for which you overcame a particular problem. SA: I have re-designed a memorial garden for the Rotary Club with S.T.A.T.E. (Students Taking Action for Tomorrow’s Environment), which is a local volunteer youth group. The garden is in a prominent public place on Stony Brook Harbor. 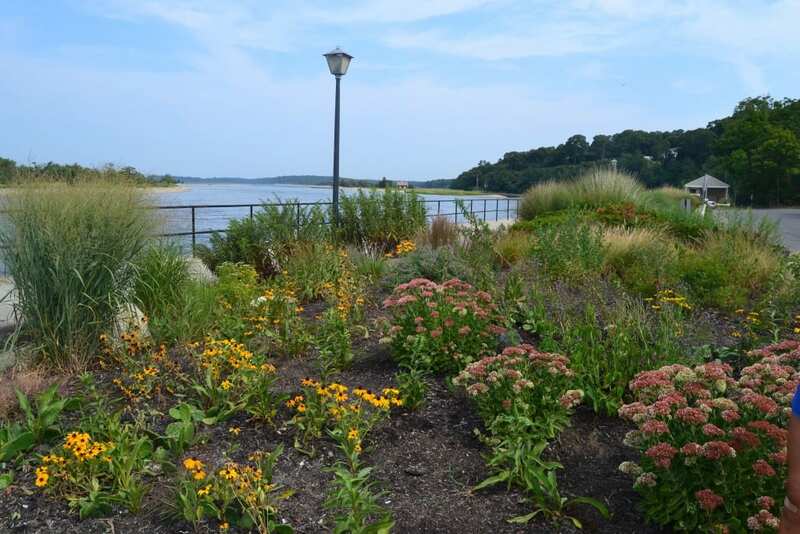 Rotary Memorial Garden, Stony Brook Harbor, Long Island planted with native plants. 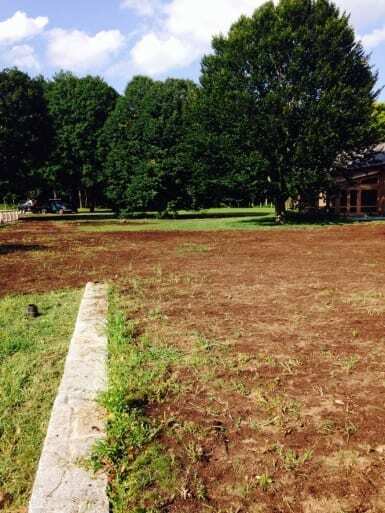 Before we took on this project the monuments were covered with invasive grasses (e.g., Miscanthus) and the maintenance crews that managed the area would “solve” the weed problem by smothering with an incredibly thick layer of bark mulch. We retained beneficial existing plants and added locally-sourced native plants. Miscanthus was replaced with Panicum and little bluestem grass. 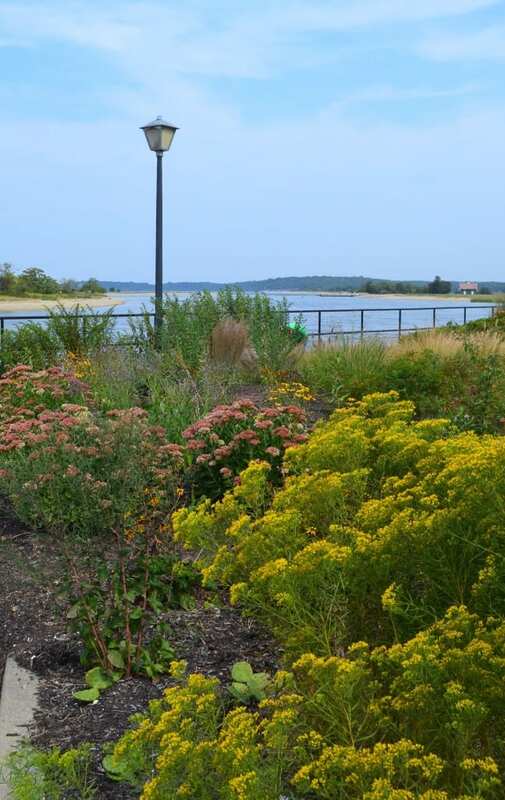 Areas prone to intermittent inundation from harbor waters were planted with seaside goldenrod. Slender goldentop (Euthamia caroliniana) in bloom. Other salt tolerant species, such as bayberry, Virginia rose, beach plum, bearberry and eastern prickly pear were planted to enclose the area and are now thriving. We are expecting the herbaceous perennials, such as goldenrods, butterfly weed, asters and mountain mints, to re-seed and fill in the area, negating the need for bark mulch. Meanwhile we regularly weed the area. We have received positive comments from passers-by, to whom we explain the benefits of native plants. The project has also engaged the next generation of land stewards. MM: Here’s a challenging project from last year. A house built with a large area dedicated to lawn was seeded twice in the spring but not much had germinated. Even crabgrass was afraid to tread here. That is about as lifeless as you can get. The soil was highly compacted and it didn’t drain. The pH was 7.1 and there was almost 5% organic matter, normally pretty good numbers. A soil textural test came back as 80% sand, 18% silt and only 2% clay. In a soil this hard, I would have expected more clay. You could not sink a shovel into this stuff. We core aerated and slice seeded in September. The lawn was finally starting to look good as the leaves were changing color. In my experience it takes a while for compost and the biological diversity it brings, to really work. We did some dormant seeding just before three feet of snow covered the ground. When I was spreading the seed, I was impressed with how thick the grass was. We expect it look great in the spring and even better next fall. “You are the master of this incredibly green lawn.” Is how the homeowner phrased it. NM: New Moon is a wholesale supply nursery. Our sole purpose is to provide plant material for projects. We typically do not get involved with the project itself. SV: We received a three acre meadow parcel that was very overgrown with invasive plants and bramble. The thorny plants and poison ivy made it difficult to bring volunteers into the area to help with clearing. We came to a symbiotic relationship with a local sheep farmer who agreed to supplement her sheep with goats and browsed the herd for a couple seasons successfully culling back the invasive plants, brambles and poison ivy. 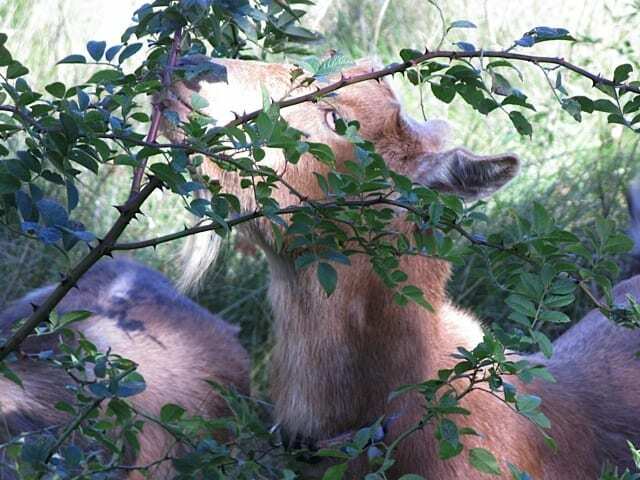 Subsequently Habitat now cares for a small herd of Nigerian Dwarf Goats moving them around the meadows for restoration and ongoing maintenance. ELA: Do you have any tips for reducing inputs and conserving resources? SA: I try to buy native plants from nurseries that provide locally-sourced material. 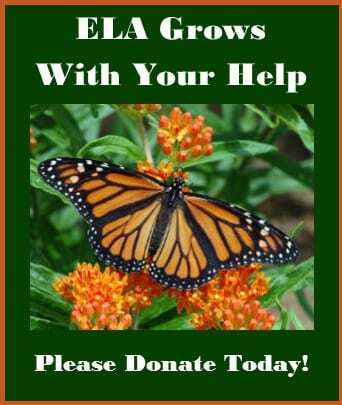 I am also involved with LINPI (Long island Native Plant Initiative), which is a non-profit organization whose mission is to protect the heritage of Long Island’s native plants by education and outreach to the nursery industry and the gardening public. MM: We like to use on site leaves for mulch. I wish we had a better way to shred them on site. The climate is changing, and with the drought in May and a hot dry September, watering sure helped this year. Those are the months when we do our seeding. The more we can improve the soil with compost and core aeration, the less water is needed. NM: When possible and practical we source our material locally. Efficiency is the name of the game in production. My only and most important tip would be, touch your product as few times as possible. SV: In addition to what has already been mentioned, I recommend building rain gardens to reduce stormwater runoff, using solar panels to charge or supplement the charging of battery powered equipment, and using non-carbon producing tools as much as possible.